1. 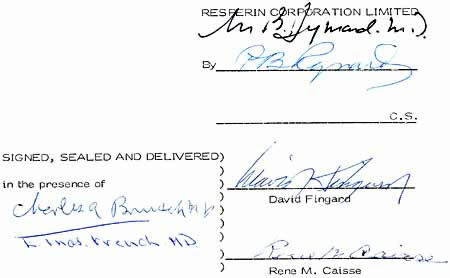 The photostatic reproduction hereto annexed and identified by my initials is a true copy of the Agreement between RESPERIN CORPORATION LIMITED, DAVID FINGARD and RENE M. CAISSE bearing date October 26, 1977. 2. The said original was produced for me at my office at 17 O'Leary street in the City of Campbellton, New Brunswick, E3N 3G9. 3. I have Carefully compared the said photostatic reproduction with the said original document. An act whereof being requested, I have granted the same under my notarial form and seal of office to serve and avail as occasion shall or may require. IN TESTIMONY WHEREOF, I have hereunto subscribed my name and affixed my seal Notorial at the aforementioned City of Campbellton, this 30th day of April, 1996.
not be entitled to assign its intrest in this agreement during the afore-said six months' period to any other person, firm or corporation without the express written consent of Rene M. Caisse. 12. In the event that any party to this agreement fails for any reason to fulfill and discharge such party's responsbilities under this agreement or fails to adhere to the terms and conditions set out herein, the other party or parties shall be entitled to take all appropriate legal recourse against the defaulting party. IN WITNESS WHEROF the parties hereto have executed this agreement.